About 20 miles south of Carlsbad, NM on the east side of NM 62 is some Bureau of Land Management (BLM) land which means you can camp there for up to 14 days. The parcel I decided to camp on is called Parks Ranch. The reviews I had read of Parks Ranch mentioned some pretty rugged road getting into it so I planned on being flexible (and cautious) getting to it. 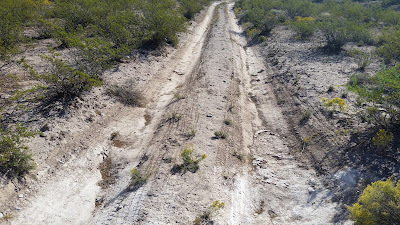 Turning off NM 62 immediately after the 10 mile marker you cross a cattle guard and drive onto a pretty rocky road. The road deteriorates about a mile from the highway and my gut told me I wasn't going to try pulling my six month old Mini any further in, at the same time a single campsite complete with fire ring appeared on my left so I decided to pull in and camp there. The Mini's site about a mile short of the actual campground. After setting up at the site I lucked into I decided to walk the remaining mile to the real Parks Ranch camp area and after about a quarter mile my "gut feeling" about bad road ahead was confirmed. The road was so deeply rutted the Mini would have clearance problems. When i got to Parks Ranch campground on foot the campsites there didn't appear to be any more desirable than the one I ended up with so I was happy to camp where I stopped. One of the Parks Ranch campground sites backing up to a ravine. I stayed at my campsite for four days, (the Astros' World Series games were to be played at night so I wanted to be somewhere with hookups for them) and got a real chance to test out the Mini's solar setup. 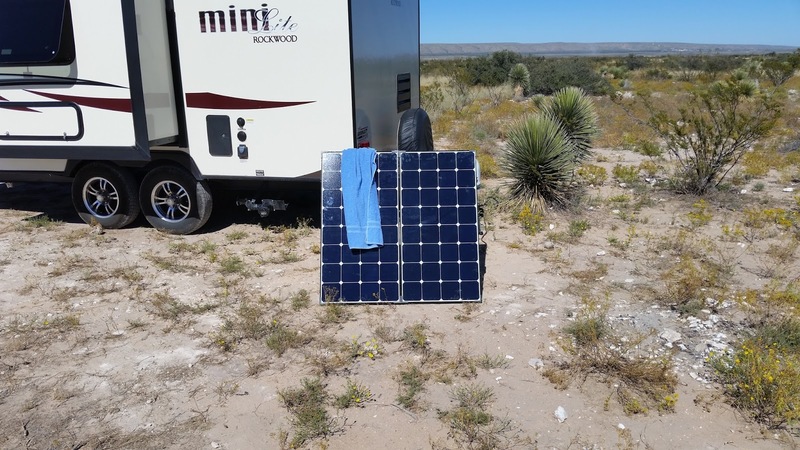 One thing that became apparent was that in cloudless New Mexico sunshine the 200 watt solar suitcase could easily overpower the Mini's new lithium ion battery pack which the manufacturer rates at 100 watt maximum charging input. To limit the power coming in during peak sun I came up with the idea of hanging a towel over one of the suitcase's 100 watt solar panels, effectively reducing the power charging the battery to 100 watts. Surprisingly, even a small amount of cover reduces the entire panel output. 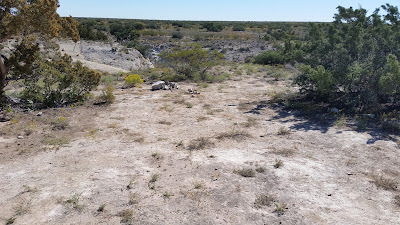 My campsite had just a very minor bit of road noise from 62 during the day and none at night, While I camped there no other campers were at Parks Ranch and it was great getting my daily walks in on the primitive roads. 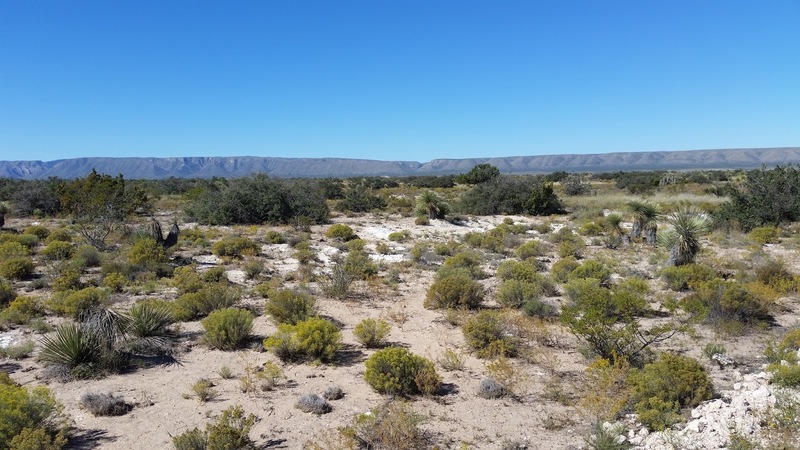 A representative sample of the terrain around Parks Ranch. 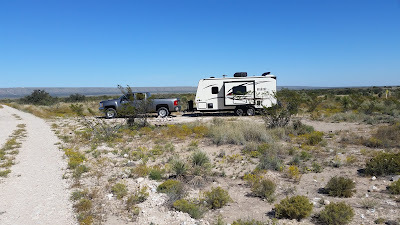 I was really satisfied with my camping experience on the BLM land around Parks Ranch and would have stayed a few more days if not for the aforementioned must see Astros games. 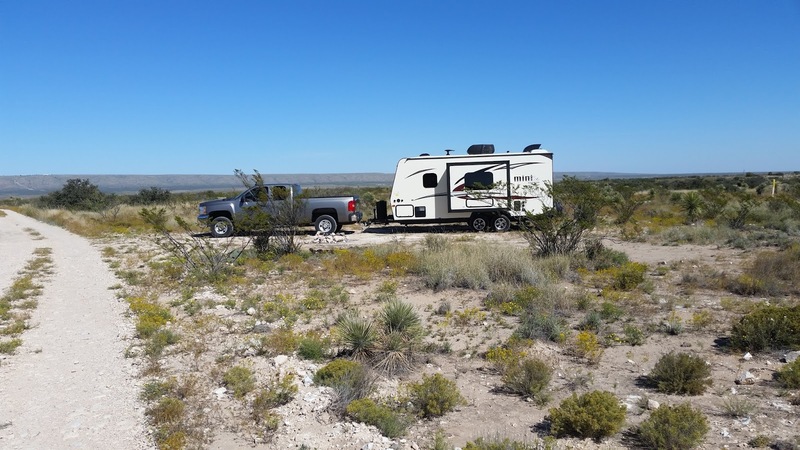 One caution: if you plan on making it all the way to the actual Parks Ranch campground make sure you have high ground clearance on both your vehicle and towed unit or risk damaging one or both from bottoming out!